Take the Klipper Road/Rondebosch offramp. Travel down Klipper Road. Turn left at the Main Road robots. Turn right after the Riverside Checkers Centre and into Belmont Road. Continue down Belmont Road, over bridge and straight over Liesbeeck Parkway and Campground Road. The Rondebosch Common will be on your left hand side. Travel over the Milner Road/Park Road robots – the road is now called Park Road. Continue down Park Road for four blocks. When you reach the 4-way stop signs, turn left into Forth Road. 22 Forth Road is on the right hand side, surrounded by a tall hedge. Take the Rondebosch off-ramp from town. Continue straight over the Klipfontein Road robots. 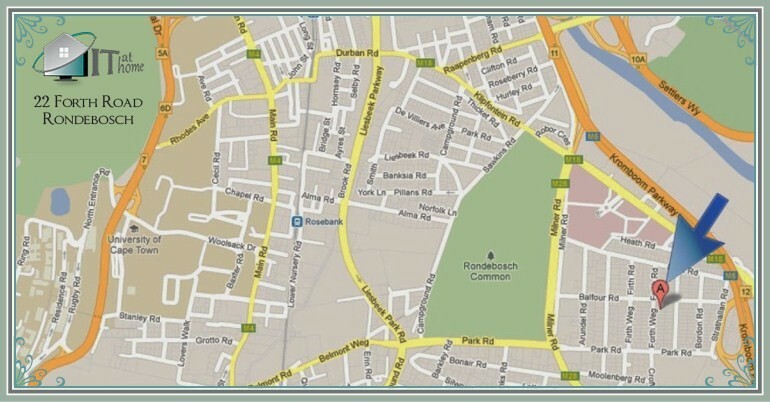 The Rondebosch Common will be on your right hand side, and the Red Cross Hospital will be on your left. Take the second turn to the left – Balfour Road. Turn right at the fourth road – Forth Road. 22 Forth Road is on the left hand side. It has a thick hedge.